On Saturday we went to see London Wasps vs. l'Union Sportive Arlequins Perpignan in the Heineken Cup. 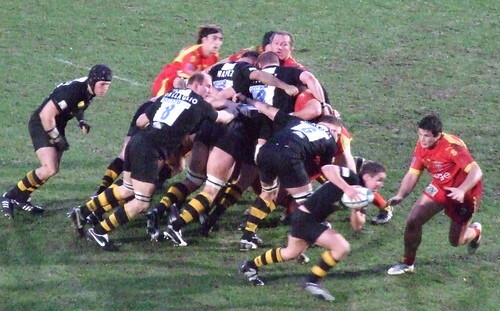 The situation going into the match was that Wasps were leading the group by 15 points to Castres Olympique's 13. If USA Perpignan won then we'd drop to second place, with a win the following week almost certain for l'Union Sportive Arlequins Perpignan against Benetton Treviso. It was a 'must win' game. The game was hard fought, but Wasps was victorious with 22 points to 14, just denying USA Perpignan a losing bonus (it's 4 points for a win, a bonus for scoring four tries, or for losing by seven points or less). In a few places it looked like it might get a bit nasty, with fists being raised, but people restrained themselves. The game was won thanks to the kicking skills of Alex King, who had a 100% kicking record, scoring four penalties (some from distance) and converting Dominic Waldouck's try. USA Perpignan failed to convert their try, and were held back from scoring a second try. It could have so easily have been 23-22 in USA Perpignan's favour. As it is, then a win against Castres Olympique next week will see us through, as will a losing bonus (assuming that Castres Olympique don't also get a bonus). If both teams get the bonus, with a Castres Olympique win, then it comes down to the head to head performance, the number of tries scored and point difference. In the above situation, they will have scored four tries, which will clinch it. For goodness sake, play for the win, not the bonus! That way is suicide. It really was a good game, edge of the seat stuff...though a boring landslide would've been nice! There are now two away fixtures, Castres Olympique next week, and Worcester Warriors the week after. Then the six nations begin. There are four matches left at Adams Park, with the next being against Sale Sharks in February.